I had heard of Henry David Thoreau's classic, Walden (1854), while growing up; but I first discovered it in graduate school. 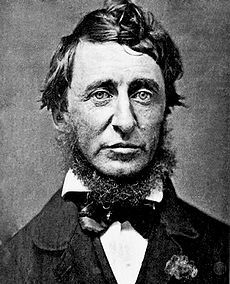 Thoreau (1817-1862) was a prolific writer, but he was largely unappreciated during his lifetime. He was an early American transcendentalist philosopher and one of the first naturalists. He advocated the abolition of slavery all his life, and his book, Civil Disobedience, informed the thinking of Mohandas Gandhi and Martin Luther King. Walden is his account of his solitary life in a cabin on Walden Pond, a 60-acre lake located in Concord, Massachusetts. It's written like a personal journal that collects his experiences and thoughts during the two years, two months and two days he remained on the pond. To give the book structure, he reframed his story as the four seasons of one year. Written in his later years, it contains most of his contrarian opinions about religion, business, government and culture. On FOCUS - "You must not only aim right, but draw the bow with all your might." On FRIENDSHIP - "We must have infinite faith in each other. If we have not, we must never let it leak out that we have not." On LOYALTY - "Be true to your work, your word, and your friend." On SELF-AWARENESS - "Many men go fishing all of their lives without knowing that it is not fish they are after." On SUCCESS - "Success usually comes to those who are too busy to be looking for it"
I really liked this post because I'm about to read Thoreau. I bought Walden after Christmas. Thoreau and Walden changed my life when I encountered them in a high school English class. It was the first thing I got really excited about in school. I also have a special appreciation for his wise friend, Emerson. Thanks for this post, always a nice shot in the arm (and heart) to hear this Master.